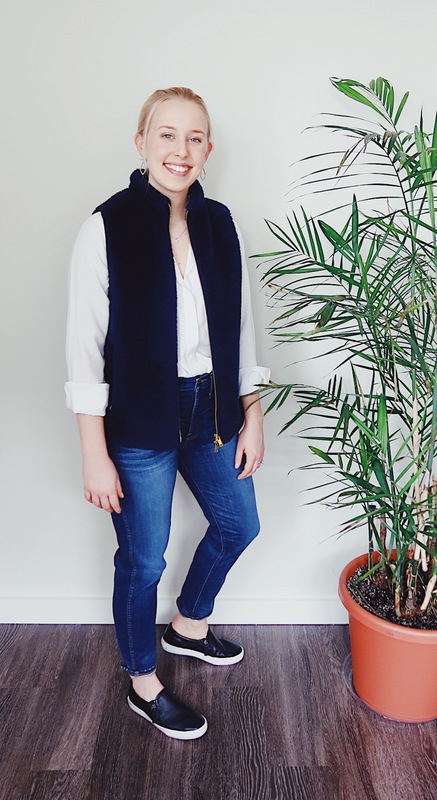 As the seasons are changing, I wanted to share with you some of my go-to outfits from this past winter, and some of the pieces that I consistently go back to (Sloan pants - I'm looking at you!). Keep reading below! I wear these pants at least 2-3 times per week (yes, I have multiple pairs). I love a cozy sweater and scarf because I am ALWAYS cold in the office! These are the same pants as above, but in a dark grey color. I also love the color and style of this cowl-neck sweater - it's an easy winter option! I also wear these flats most days of the week. They're so comfortable, and I think that they look professional. I like wearing skirts in the winter with tights and booties. I got this skirt at Anthropologie awhile ago, but any statement patterned skirt will do. I also really love the animal print detail on the back of these boots - it's a fun pop to add to any outfit. There's really nothing like jeans and a white shirt. I also usually bring a fuzzy vest (I really am always cold) to throw on if needed. Love this look for casual Friday's! I'd love to hear from you - do you have any places that are your go-to's to shop for work-appropriate clothing? Let me know in the comments below!